Emma Rose Roberts (born 10 Feb 1991 in Rhinebeck, New York), American actress, is the daughter of Eric Roberts, actor, and neice of Julia Roberts, actress, and Lisa Roberts Gillan, actress. She starred in the Nickelodeon TV series Unfabulous as Addie, and starred in the movies Hotel for Dogs, Nancy Drew, Aquamarine, and We're the Millers. She returned to television in 2013 starring in American Horror Story, Freak Show, and Scream Queens. 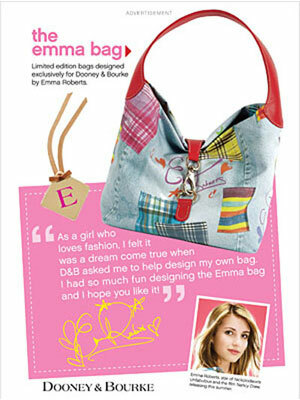 Emma Roberts was signed as a spokesmodel for handbag designers Dooney & Bourke in 2006, and she designed her own handbag named the "Emma Bag". In 2009 Emma was named the brand ambassador for Neutrogena. In 2016 she was the face of Canvas by Lands' End with model Jordan Barrett, the fall campaign was shot by Mario Testino.